When people think of Asperger’s, they often think of a little boy or a young man. This is the picture portrayed in television and movies and in many awareness campaigns. As a result, girls and women with Asperger’s can feel left out, which is ironic, since they have a syndrome which by its nature already causes people to feel left out. In girls, the diagnosis of Asperger’s frequently comes much later than it does in boys, because Asperger’s can look different in girls than it does in boys. There needs to be increased awareness of how Asperger’s presents in girls so these girls can be diagnosed at an earlier age and avoid being incorrectly labeled as strong-willed, rude, outspoken, ADHD, perfectionist and spoiled. This book does a fabulous job of humanizing Asperger’s in girls. Fair warning: you will not be able to stop reading it once you start. It is very well-written and informative. As the parent of a girl with Asperger’s, or as a girl or woman with Asperger’s, you will find understanding, non-patronizing compassion, and vindication in this great new book. This is a support group in a book! While this book is written by a parent, it is not just another collection of “look what we went through, our life is so hard” stories. This author goes well beyond anecdotes and teaches important information in an articulate, intelligent manner. She has walked your path and can discuss it intellectually as well as passionately. Although people often skip over the foreword section, don’t do that with this book. Rudy Simone, an Asperger’s self-advocate and the author of Aspergirls and Asperger’s on the Job, wrote the foreword and it is well worth reading. The book is organized by subject and covers the diagnostic process, school, therapy, social and community, day-to-day issues, holidays and holding your marriage together. At the end of each chapter there is a mini-section called “Pink Pearls.” These are quick tips for caregivers and others, and one thing for which the author is grateful. As the foreword states, this book is “both lighthouse and life raft for parents.” This is a much-needed book, containing information that will help many people. As a girl, struggling with Asperger's can be tough. Raising a daughter with Asperger's can be a struggle too. 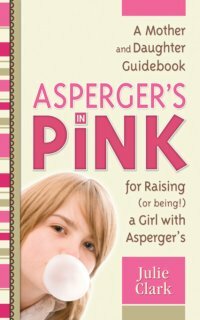 Enrich the mother - daughter relationship without ever having to feel indifference as you read Asperger’s in Pink for Raising (or being!) a Girl with Asperger’s: A Mother and Daughter Guidebook. Grab yourself a copy now by logging on to Future Horizons. Copyright 2010 SpecialNeedsAlmanac.com All rights reserved.